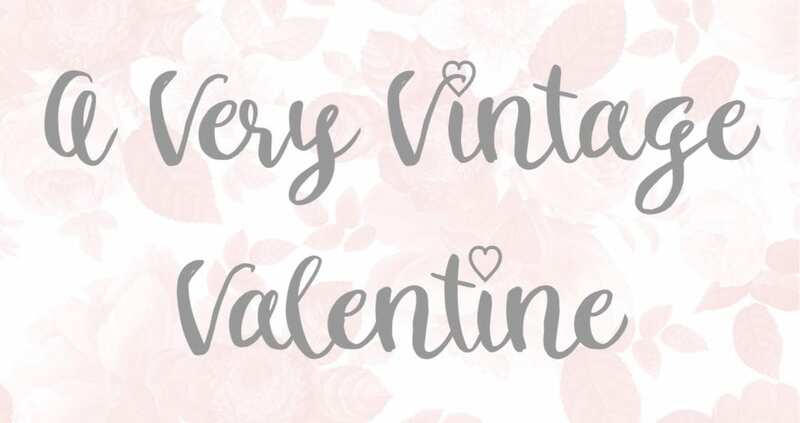 Thank you for joining us today as a group of us share a vintage side of our Valentine’s decor and celebrations! 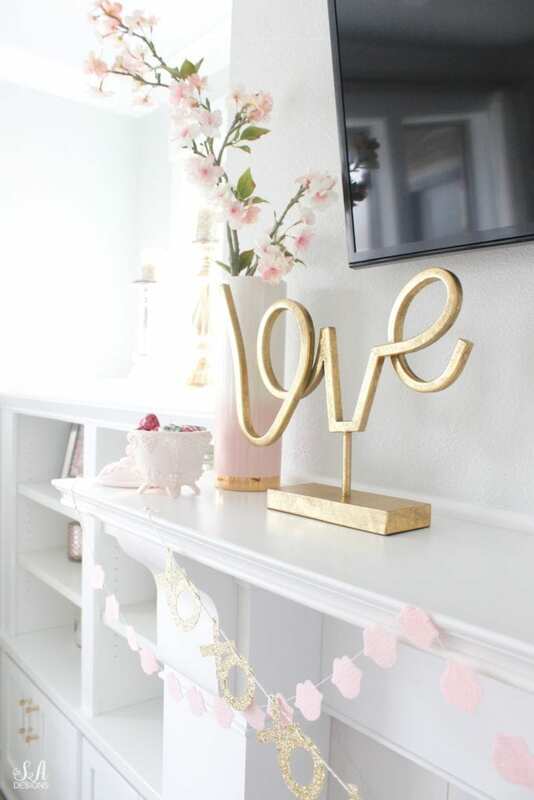 One of my favorite things in decorating our home is to mix the “old” with the “new”. 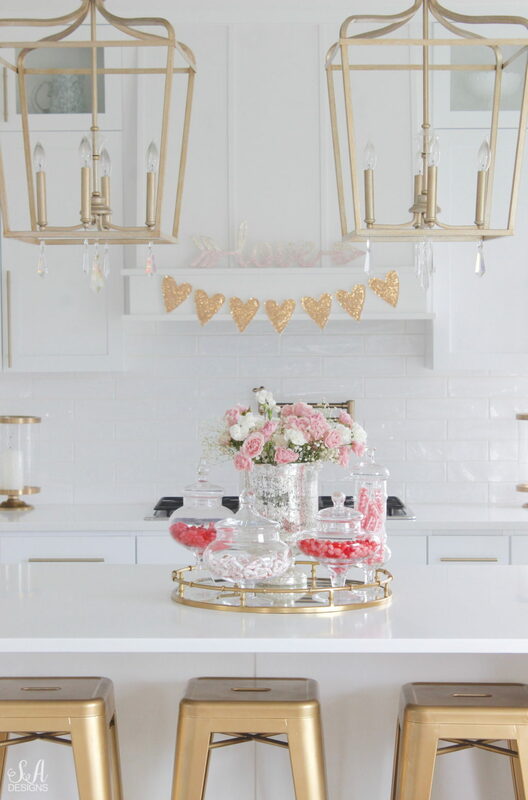 I have some fun pieces to share with you today that I’ve used to create a soft pink vintage Valentine’s tablescape and also pieces throughout my home. I’ve taught my kids, from a very young age, the importance of loving vintage and antique items and that they all have a story behind them. In many cases, the saying can be true that “they just don’t make them how they used to”. 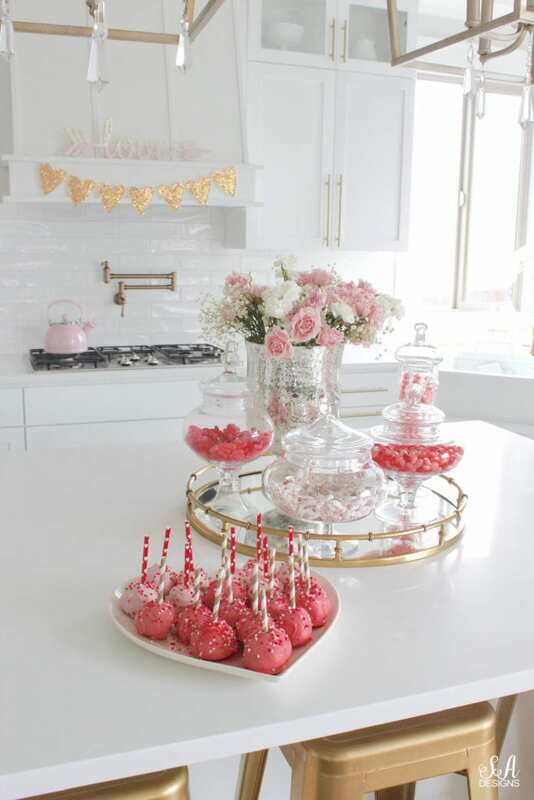 I started this soft pink Valentine’s tablescape with a new soft pink floral tablecloth and coordinating pink floral plates. I couldn’t resist when I saw the email announcing their arrival. 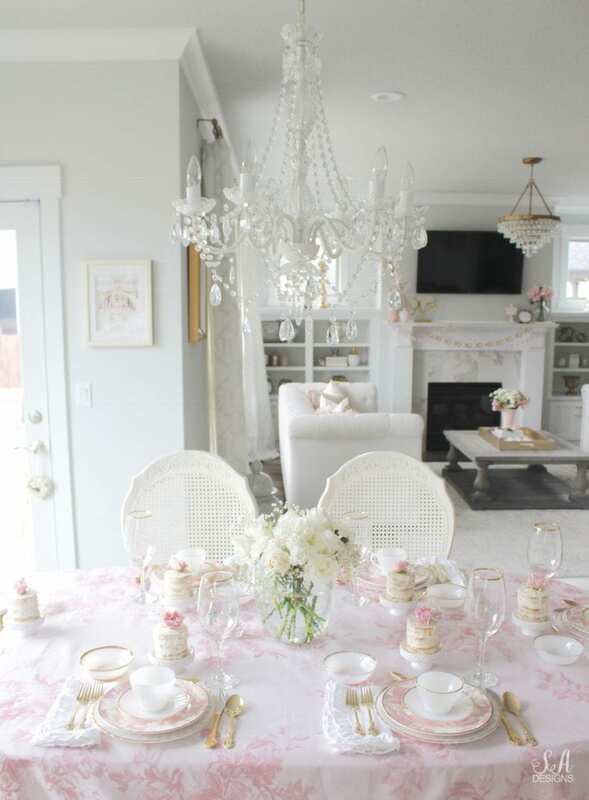 Last spring, I was on my local Facebook marketplace looking for something and came across an entire collection of gold-rimmed milk glass place settings that included teacups and saucers, plates and bowls and serving platters, etc. It was amazing. A sweet older woman was selling her home and moving in with her daughter and needed to get rid of them so I was happy to take them. She said they had sat at many happy dinners and I loved hearing that and could only hope that they would see many more occasions like that. 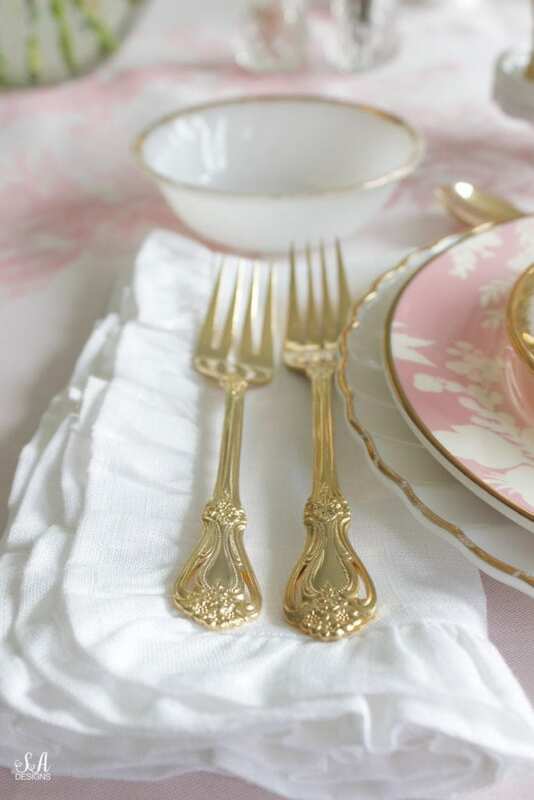 After layering my vintage milk glass plates with my new pink floral plates, I brought out my ruffled linen napkins and placed the prettiest gold flatware that I found recently at an antique store that I often frequent here. 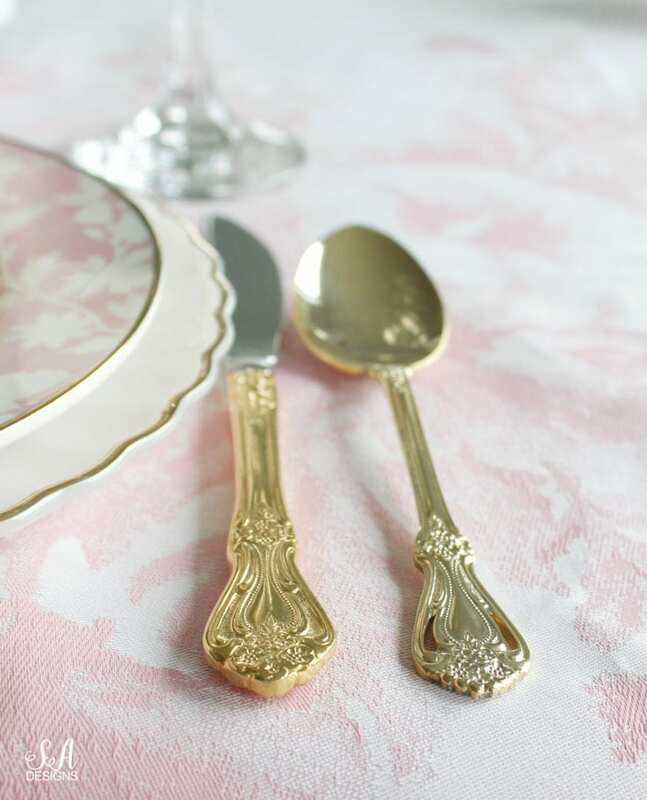 I’d been wanting some like this for a long time and I found the entire set for $89, including serving spoons and more. I was thrilled! 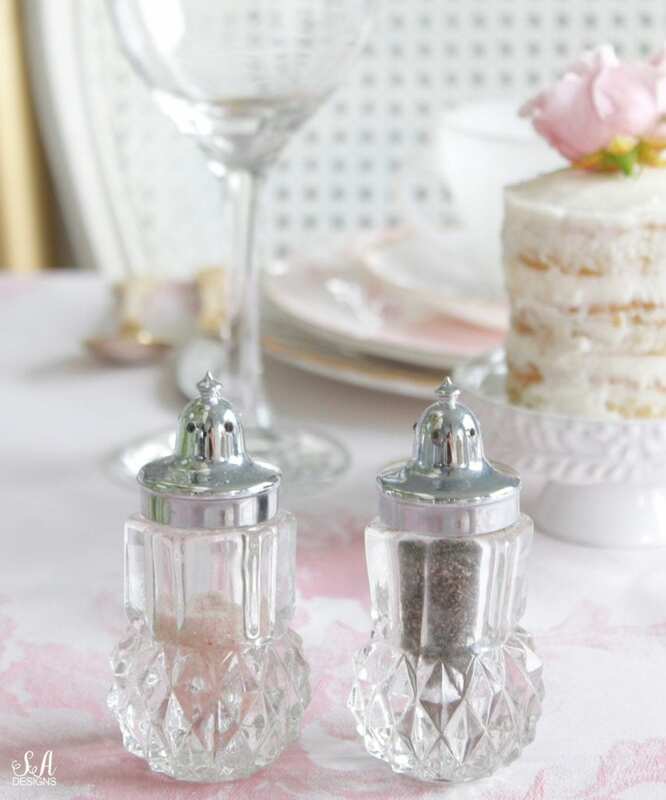 A very special set of crystal salt and pepper shakers is always found on my table. My sweet grandmother passed away last spring and, along with many other special treasures, I brought these home with me. 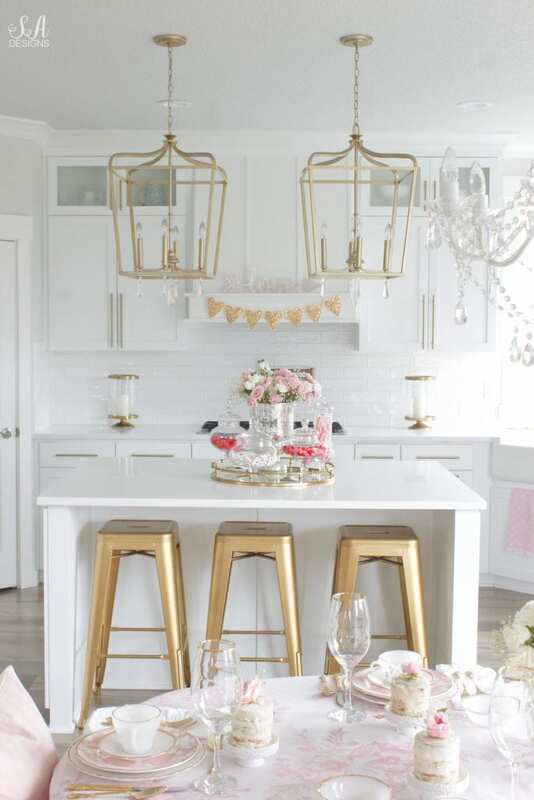 I love that every time I see this set, I think of her and my grandpa and their beautiful home and all the special times we’ve spent around their table together over the years. Oh how I miss them! Of course, no meal is complete without dessert. 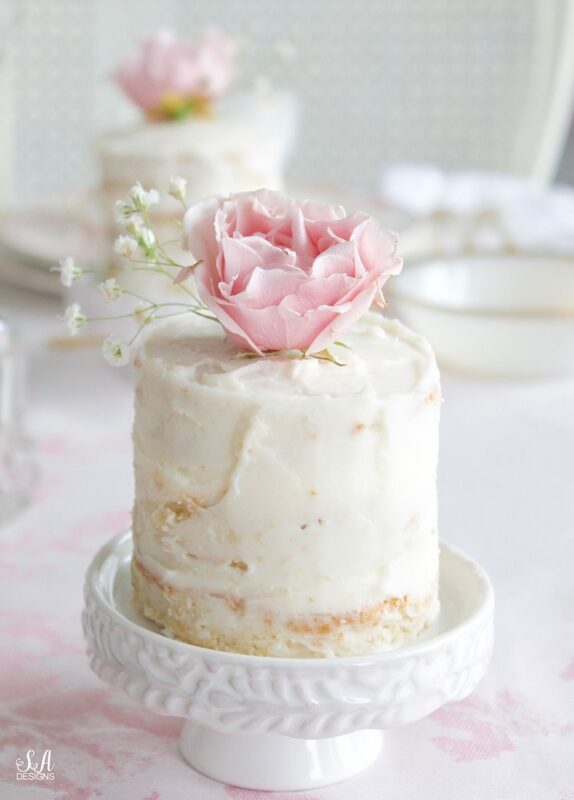 Last year I shared a beautiful naked cake that you all just loved so I thought you’d appreciate this dessert as well. 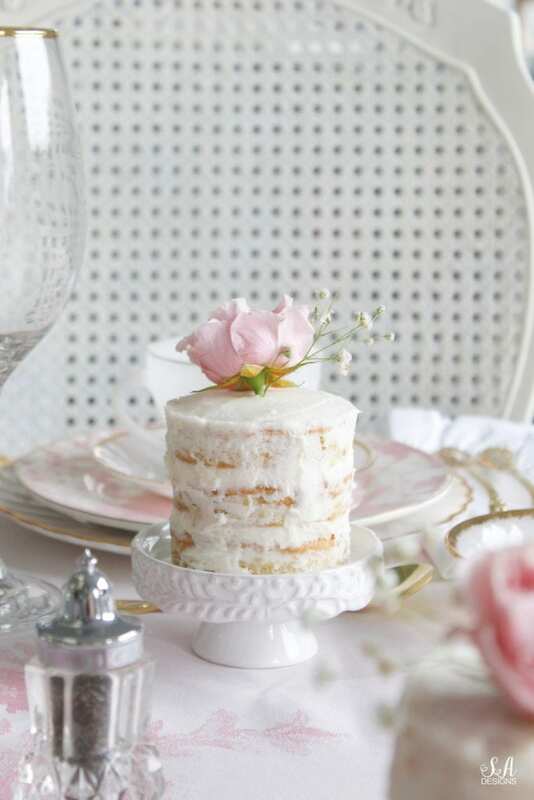 These individual mini naked cakes were the perfect size for these darling individual cupcake stands and then I placed one at the top of each place setting. They were so easy and so delicious! 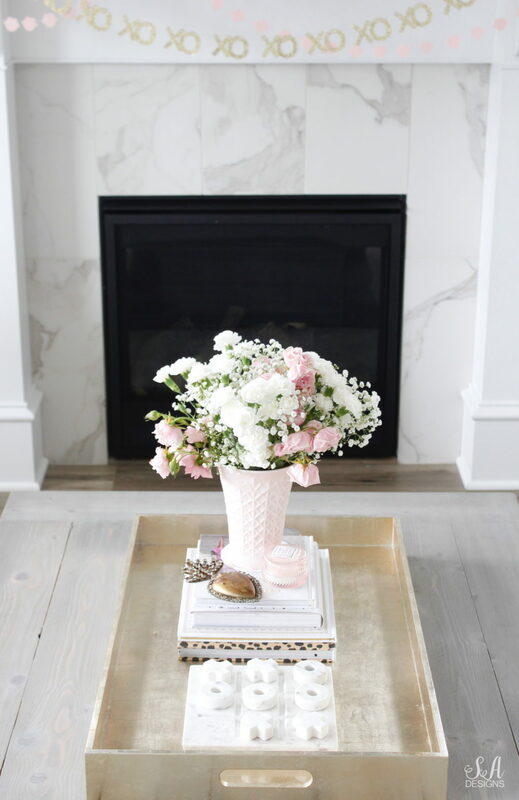 A precious little round vase of white roses and baby’s breath adorns the center of the table. I’ve always loved the softness and sweetness of baby’s breath. Plus, it’s an inexpensive way to fill your floral arrangement. There’s not much of anything vintage in my kitchen but there is candy, ha! My kids love that I fill the apothecary jars with candy for each holiday. There’s something about having it out in plain sight that doesn’t tempt us and we don’t touch it often. We mostly offer it to guests. But take that candy and put it out of sight in the pantry and we will eat it all day long haha! Weird, right?! 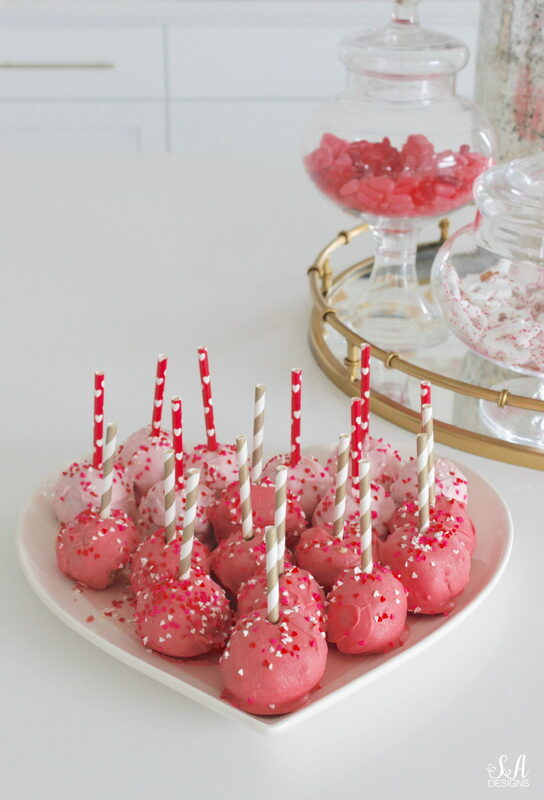 But we make up for it because I love to bake and there was leftover cake from those mini naked cakes for cake pops so we shared our treats with friends. Remember that local antique store that I just love and mentioned earlier? 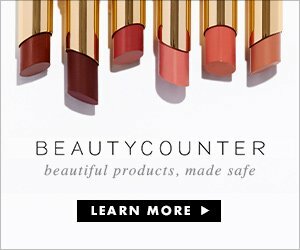 Well, I scored there recently and found the most fabulous pieces. I went in looking for a few little things but never did I intend to hit the jackpot. 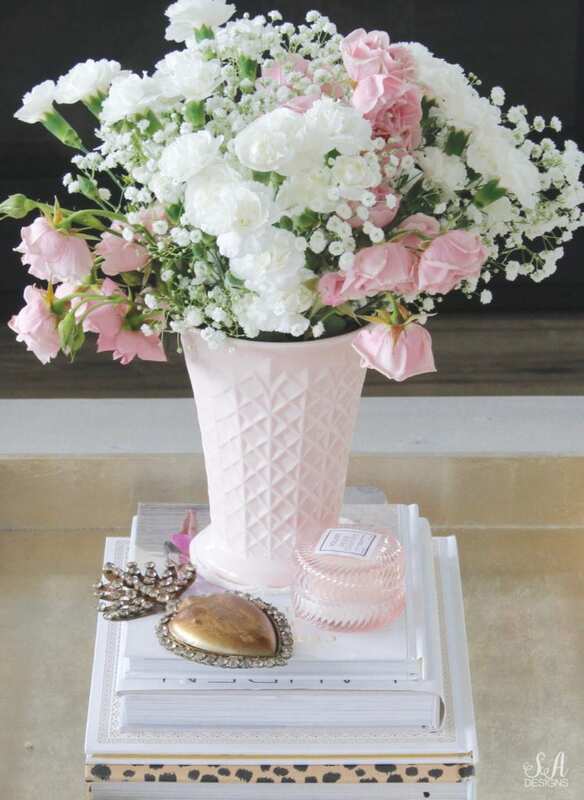 When I happened upon this pink milk glass vase, which is hard to find, I grabbed it as quick as I could. Hmmmm, I thought. 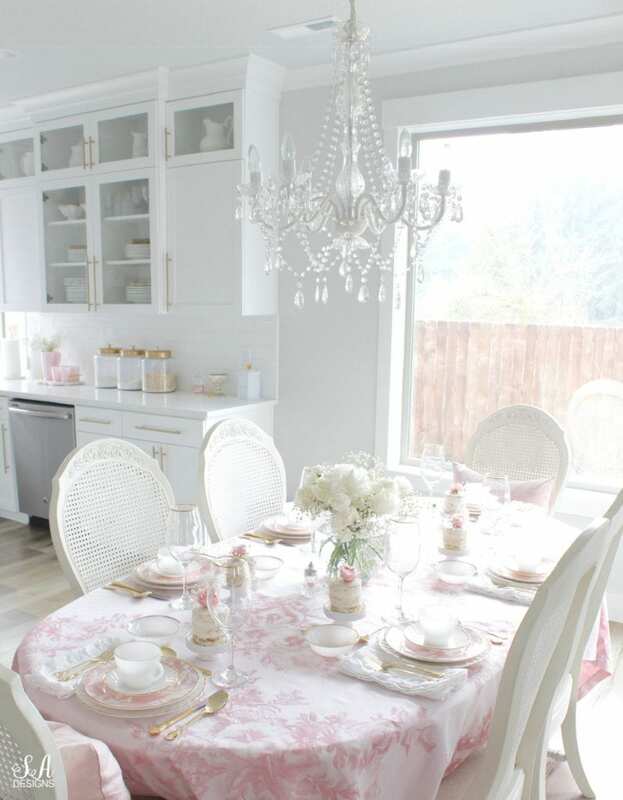 If only I could find more pink milk glass! Just a few minutes later, and a few booths down inside this store, I found this darling pink milk glass candy dish. Woohoo! 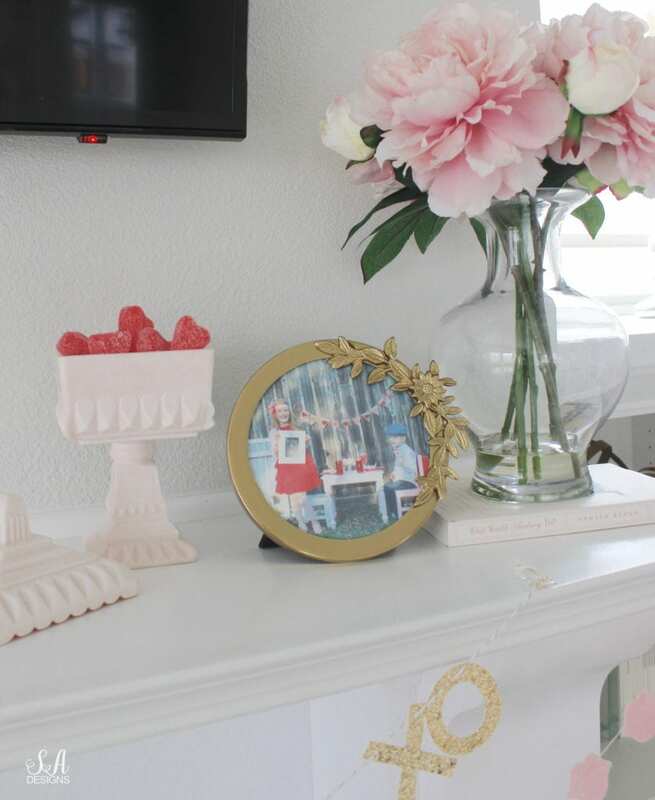 I knew it would be darling for some candy hearts and placed on my mantel right next to one of my favorite Valentine’s pictures of my kids from about 6 years ago (we lived in Waco, TX at the time). I put it in this new frame and smile every time I see those baby faces. What a fun shoot that was! Back to that antique store…. 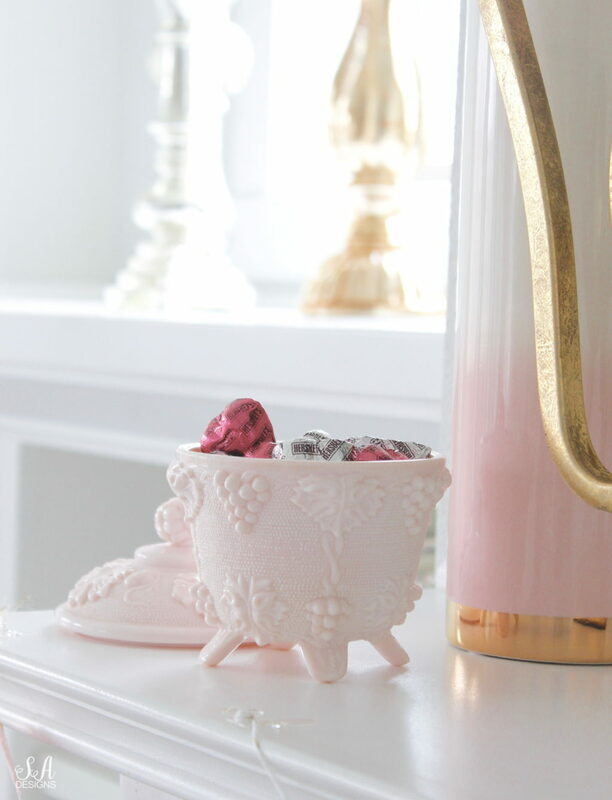 After finding a few other goodies, I headed to the checkout counter and there it was…another pink milk glass candy dish. I mean, 3 beautiful pieces in one day? I really had a good day of treasure-hunting and this one went on the other side of my mantel with more Valentine’s candy. Isn’t that so fun?! So don’t forget to look at your local thrift and antique stores for fun finds like this. You can also search on ETSY and EBAY for pink milk glass and find some beautiful pieces also! Of course, no photoshoot of my living room is complete without Giorgio begging to be in a picture, ha! Since he’s wearing red and coordinating with my Valentine’s theme, I guess it’s okay. 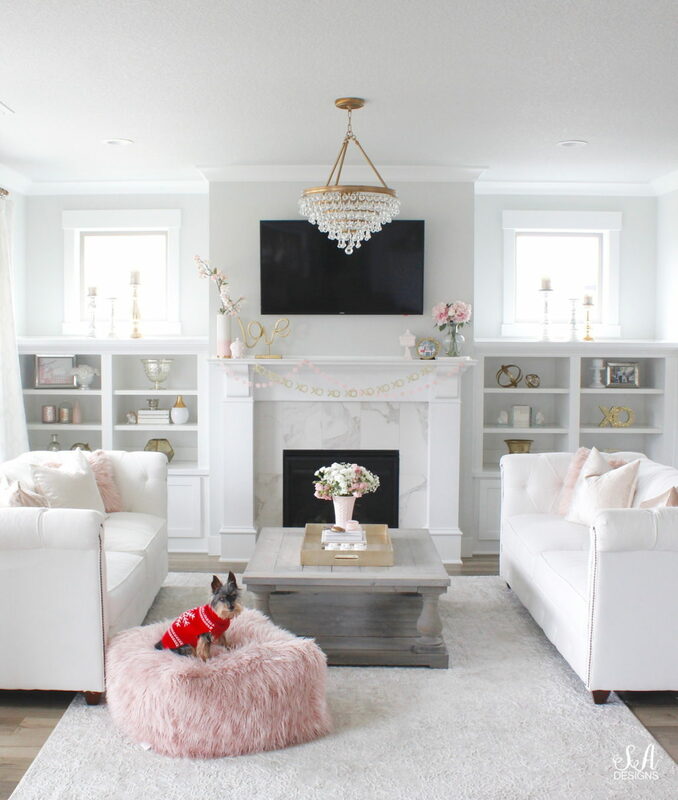 This cute blush faux fur pouf was sent to me by my friends at Perigold and I can’t even tell you how much my kids (and Giorgio, obviously) love it. You can often find then lying or sitting on it and reading or watching TV. It’s beautiful, soft and functional and such a fun piece to bring in. 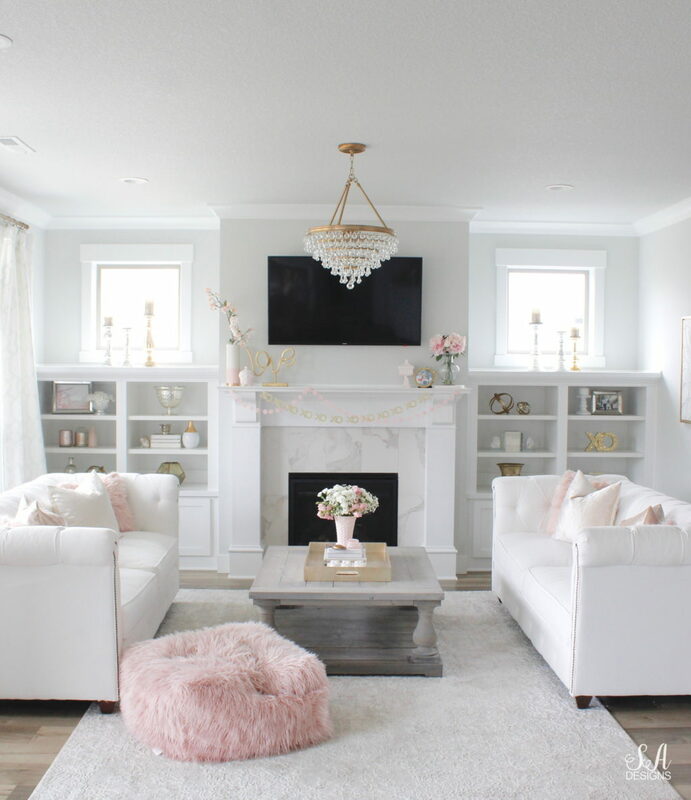 I love that they go perfectly with my throw pillows and add a pop of color and texture to the room. I always find the best things at Perigold! 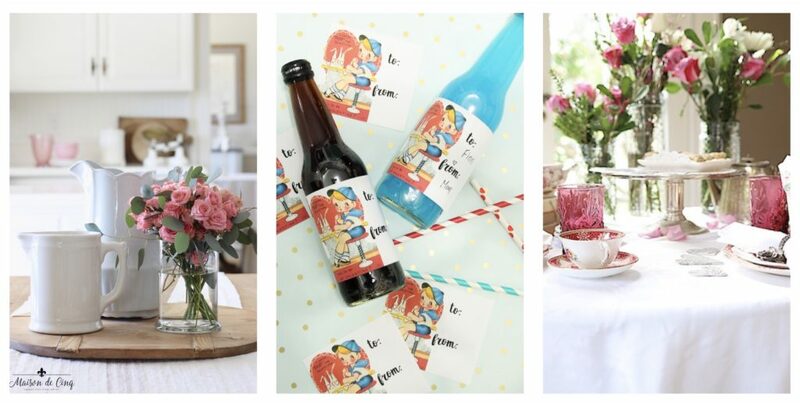 If you want to plan a really fun Valentine’s party for your family or friends, check out my Soda Shoppe Valentine’s Party I threw a couple of years ago, just for the 4 of us at home. I told the kids to dress up like they’re in the 50’s about an hour before dinner and surprised them with this Valentine’s dinner. They went NUTS over it and it was one of my top favorite blog posts of my readers from 2017. For your convenience, I’m adding shopping links of the items from this post (or similar) below. Scroll right and left by clicking on arrows. Thanks so much for including me today – such a fun hop and I love everyone’s wonderful ideas! What a gorgeous Vintage Valentine tour, Summer! I agree with Sheila, Valentine’s Day is so ‘you’! 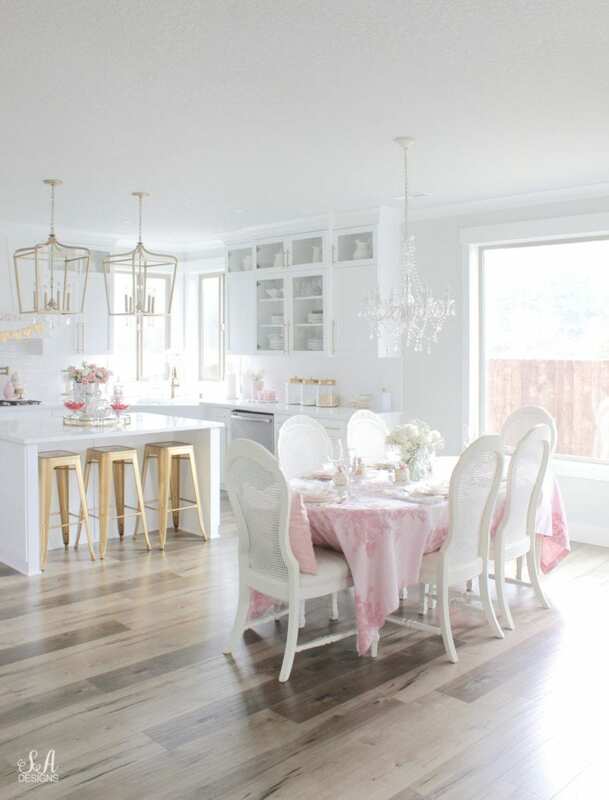 I can’t believe all the pink glass milk finds you scored and I love that white and gold china collection. Thanks for organizing such a great tour! 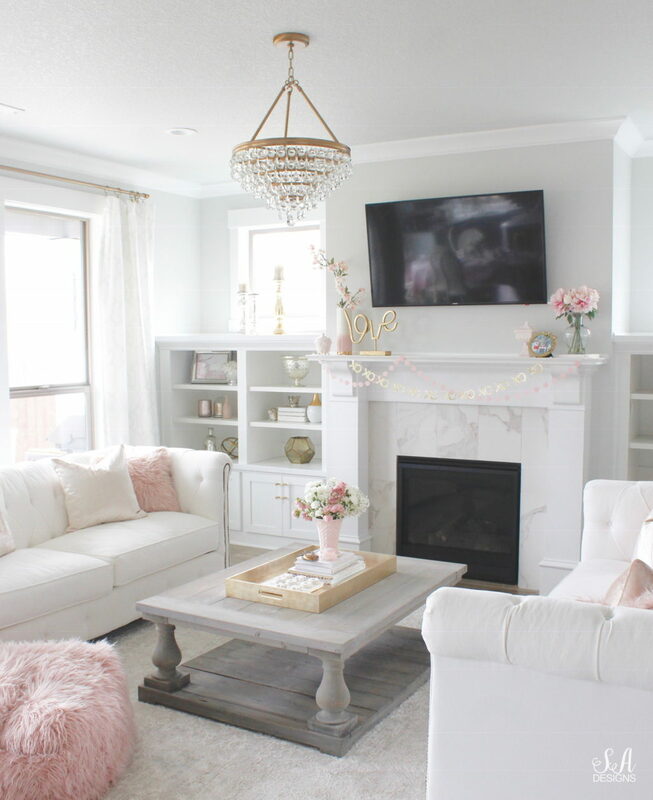 Summer, oh my goodness you’ve outdone yourself with this gorgeous decor! 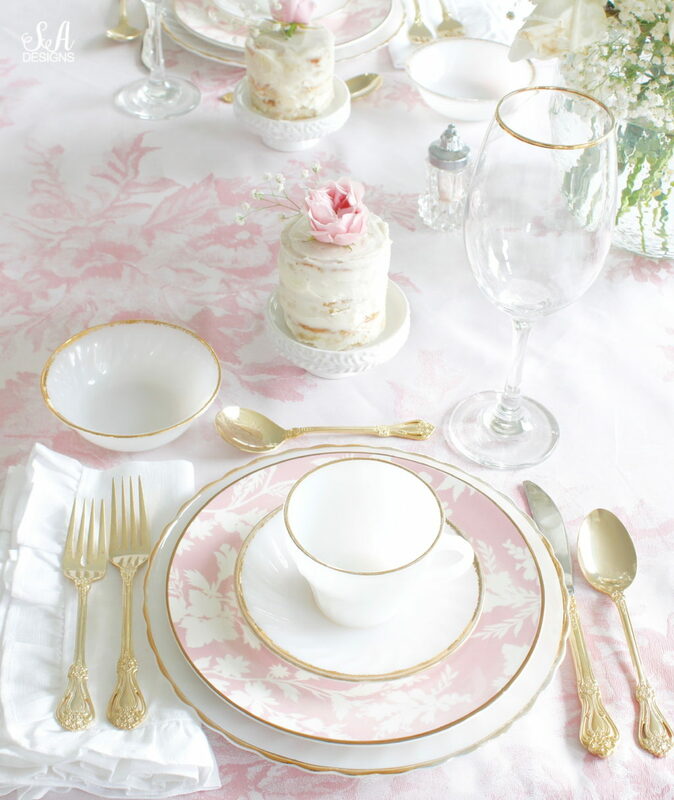 Adore the pink floral tablecloth and dishes! 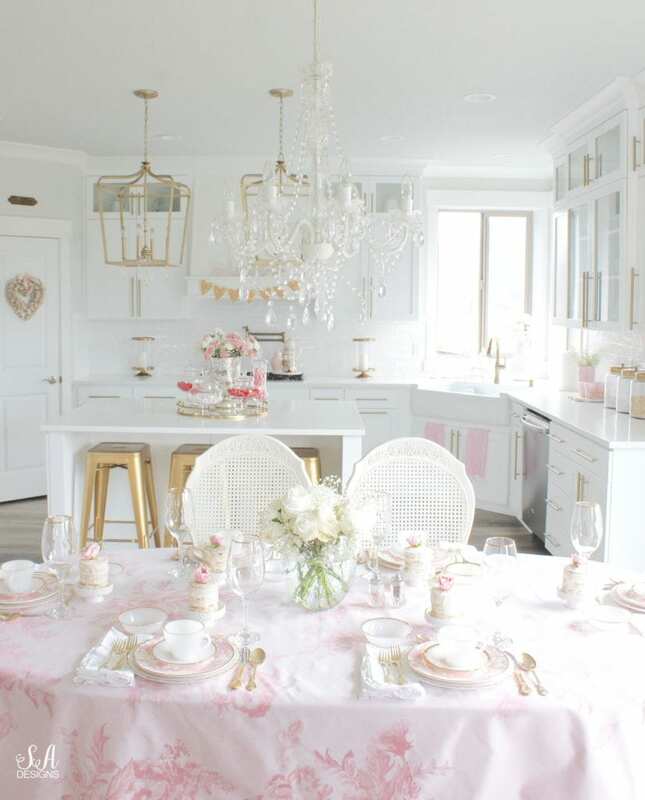 And the gold rimmed white china and all the pink milk glass are such great finds! 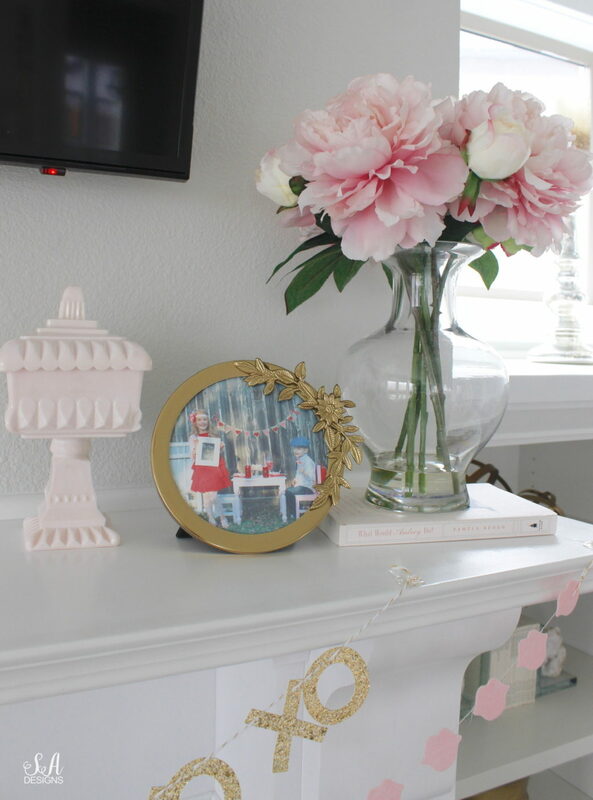 We love treasure hunting for vintage finds and you’re found some good ones, so fun! Thank you so much for organizing and including us in this fun hop!! Would you share your naked cake recipe and how you assembled the cake? Did you use individual cheese cake forms to bake the cake in to get them that small? 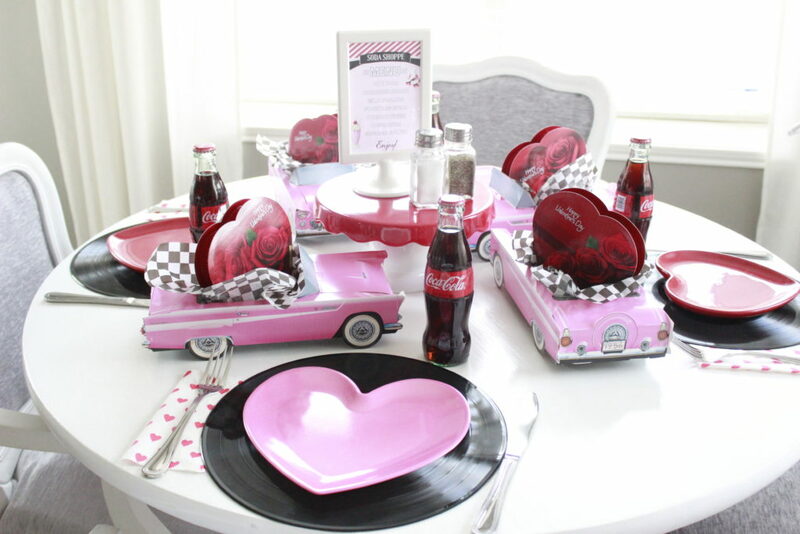 Where did you order the pink Cadillac food boxes?